Delkin announces some new additions to its eFilm PRO Card line. 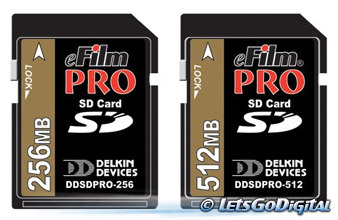 The new eFilm Secure Digital (SD) PRO Card will have a storage capacity of 256 and 512MB (with SD PRO 1GB coming in Q2-2004) and are, according to Delkin, expected to be among the fastest Secure Digital cards on the market. Transfer rate speeds up to 10 MB/s can be achieved. A 512MB SD PRO Card can hold approximately 4 hours and 20 minutes of MPEG4 video, 4 hours of MP3 audio (128 kbps), and 1,041 JPEG photos (standard/1600x1200 pixels). Beside introducing the new line of SD PRO cards Delkin is also increasing the storage capacities of their eFilm CompactFlash (CF) PRO Cards. The existing PRO Card capacities of 128, 256, 320, 512 and 640MB will now get company of 1 and 2 GB capacities. The time that is required to capture an image is always a concern of many professional photographers. To reduce capture times Delkin developed a new technology called DQD (patent pending). The eFilm PRO cards are the only product on the market currently with DQD technology. DQD is a design and quality verification process that improves the performance of CF cards and is a Delkin exclusive.